This one is fast, easy, and tasty. 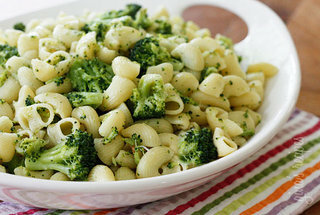 The trick: you cook the broccoli with the pasta. I recommend fresh pasta; the broccoli were only in the pot for three minutes so they were blanched rather than boiled. As usual, I left out the salt & pepper, but I added crushed red pepper flakes (the way I usually do with noodles). The only critique I can make is that it isn't thrilling - I'd call it "good not great." But if you're looking for a quick and easy dinner, it's a great way of making plain pasta more interesting.